About: This corner pub has two bars and a conservatory. Its regular customers are a mixture of local residents and office workers. The photographs on the walls show how the pub used to look. Bar food is served between Midday and 2.30pm Monday to Friday, and there is a choice of beer available. "The Kings Arms matches its Roupell Street location for tradition and allure"
Hands up if you’ve ever been to Roupell Street? If your hands are up then you know, you just know. Having only recently walked this handsome street we’re on catch up but after an evening strolling up and down it (counting and drooling over the improbable number of beautiful vintage Citroen’s parked up), now we know too. Pristine terraced cottages with their fine ‘Butterfly roofs’ form an idyllic Dickensian view of London worthy of a Conan-Doyle-Sherlock crossover. 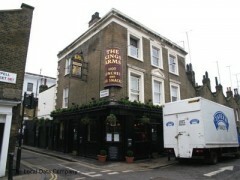 Tucked away between Waterloo station and the Southbank, the street has its own local, the Kings Arms. Just as traditional and charming as its surroundings, the pub is pure simplicity. From the heavy curtain hung around the door doing all the excluding to the horseshoe bar that splits the pub in two, it’s the kind of place tourists love and Londoners are finding increasingly difficult to find. There is a good selection of whisky and wine, while the beer selection somehow manages to qualify the King’s Arms as a ‘Waterloo craft beer pub’ on the Google. That might be stretching things a little but we do find a good range of ales on tap. We drink the Gypsy Hill Hepcat Session IPA, Chieftain IPA and the Camden Pale Ale. The front saloon bar contains the majority of the pub’s style but when it hits peak after work time and the place floods with bodies, there is a large back room that makes for a comfortable space for the overspill. Search out the street for its aesthetic appeal then stop off for refreshments at the King’s Arms – preferably on a miserable, grey November afternoon when it all feels as moody as possible.